A little girl's bedroom in pink, pale blue and grass green. The fuchsia bench tucks away toys and blankets with hidden storage. Antique white furnishings and bedding are the perfect pairing with a host of pink, blue and green accents. A re-purposed chandelier finds new life with a simple visit to the painter's studio. 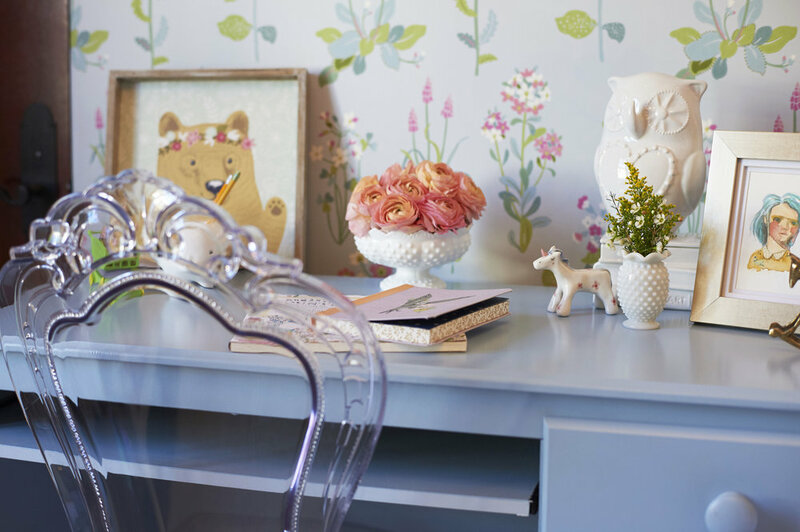 A desk once belonging to her older sister, gets a personalized makeover for the youngest girl in the house. The delightfully delicate clear Lucite chair adds a feminine whimsy to the pale blue desk. Vintage hobnail milk glass and pretty pink ranunculus add a delicate beauty to this little girl's desk. A vintage brass rocking horse from the 1960's sits among a collection of other delightful works of art, a unicorn sculpture from an artist in Slovenia and a watercolor by Klay Arsenault. Sheer white drapery panels frame the four posters of the bed in this little girl's room. On the bedside table, a delightful ceramic vase in the shape of a friendly kitten wears a silly hat of tiny pink ranunculus. Handmade porcelain flowers cluster together in this pretty wall sconce featured bedside. An oversized reading chair in antique white and fuchsia pink is set against a beautiful window view. Delicate pom-pom fringe in pink, green and white trims the edge of the custom drapery.